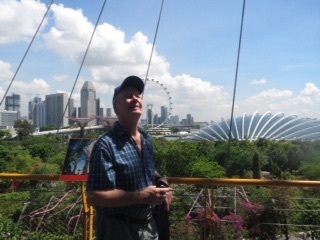 Our first action-packed day in Singapore started with breakfast at Marina Bay Sands shopping complex – early breakfast or even shopping is de riguer in Singapore. Nothing opens till late, however suitably nourished we tackled the Gardens by the Bay with our free Simgapore Airlines Stopover pass. Emerging from the subway (yes, we even managed to purchase tickets and find our way last night on the subway, after an 8 hour flight), our first sight was of the Mar ina Bay Sands from the OUTSIDE – a fantastic triple complex of high rise apartments. 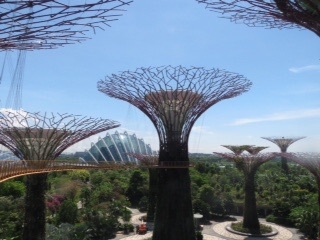 Directly behind this were the steel structures of the Supertree Grove, seen here from the Skywalk. These amazing structures are covered in bromeliads, orchids, ferns and other succulents. 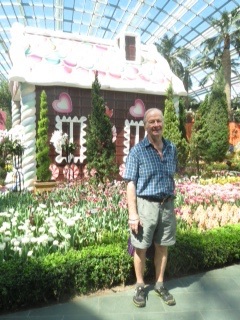 Behind Fred is the Flower Dome to the right. During April, the Flower Dome is featuring Tulipmania – just a little kitsch, with a Snow White, Little Red Riding Hood and a life-sized Knusperhaus – as well as the most spectacular display of tulips and hy acinths. More interesting was the comparative permanent display of Mediterranean plants from Australia, South Africa, South America and Europe. The Cloud Forest was our last onslaught in this wonderful complex. 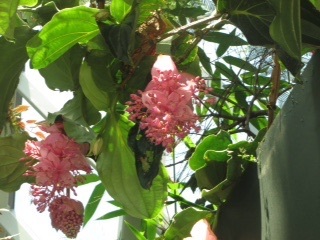 The Cloud Forest aims to mimic the high altitude environments which often have unique (endemic) plant (and animal) species and which are at severe risk of extinction with deforestation and climate change. We were treated to a waterfall on entry and then several stories of fabulous trees, orchids, insect eating plants, rhododendrons and on it went. After this experience and feeling a little tired and hot, we decided to get off the subway at Chinatown and take a rather circuitous route via the free hop-on, hop-off bus to the famous Raffles Hotel. A great white building taking up a whole block, it oozed colonial charm and officiousness. We reneged on the Singapore Sling after reading the potent mix of alcohol in the cocktail, however Fred had a Virgin Sling (mocktail) which has to a first! When we tried to book a table for Tiffin, we were told that the dress code included long pants for gentlemen – we obviously looked a lot scruffier than the usual clientele. Undeterred we are booked tomorrow at 3pm – we’ll wear our going-to-Germany clothes and will swan in with our little fingers delicately extended ready to wrap around the China tea cups! Bis bas in Deutschland! We loved the Raffles when we visited some years ago. Glad to hear it hasn’t changed. Looking forward to reading about your travels.